North Eastern Institute of Ayurveda and Homoeopathy (NEIAH) here by invites applications from Indian Citizen for the following posts to be filled - up by Direct Recruitment/ Deputation/ Short Term Contract as mentioned against each post . Eligible candidates may submit their applications in the prescribed format along with self attested copies of certificates & testimonials, two copies of recent passport size photograph and required fee. Only shortlisted candidates will be called for the test/interview as the Institute deems fit. Professor Homoeopathy college ( Allied Subject) Anatomy 1 post OBC , Physiology 1 post ST , Practice of Medicine 1 post SC, obstetrics & Gynecology 1post UR and Surgery 1 post UR . Reader (Homoeopathic college ): (Allied Subjects) Anatomy 1post UR, Physiology 1post UR, practice of Medicine 1post UR, Obstetrics & Gynaecology 1 post OBC and Surgery 1 post SC . Lecturer (Allied subject) Community Medicine 1post SC, Pathology & Microbiology 1post UR , Forensic Medicine & Toxicology 1post OBC, Obstetrics & Gynaecology 1post UR & Surgery 1post UR. GENERAL INFORMATION AND CONDITIONS Applicants are advised to read all instructions carefully before submitting their applications. a . Reservation for SC/ST/OBC (below creamy layer) and Persons with Disabilities (PWD)/ Physically Handicapped (PH) will be as mentioned against each post . b . Applications not supported by the appropriate certificate for the reservation category claimed, will be treated as General/Unreserved. In case Institute observes any thing false or any discrepancy in the certificate submitted by any candidate , his candidature will be rejected , summarily . No correspondence will be entertained in this regard . c . SC/ST/OBC/PH candidates are required to produce original certificate in the prescribed copy of format signed by the specified authority, at the time of interview. It is mandatory. d. Applications need to be supported by proper experience certificate authenticated by competent authority as per provision of UPSC /State PSC/ UGC etc. a) These posts carry usual allowance as admissible to the Central Government employee and as made applicable to North Eastern Institute of Ayurveda & Homoeopathy (NEIAH) employees. b) In case of deputation standard terms and conditions of deputation in Govt. of India will be applicable. c) In respect of contractual appointment terms and conditions including consolidated remuneration will be decided by the competent authority based on the merits of each case. a) The applicant must be a citizen of India. b) All applicants must fulfill the essential requirements of the post and other conditions stipulated in the advertisement as on the last date of receipt of the applications . Applicants are advised to satisfy themselves that they possess essential qualification, experience and fulfill all conditions of eligibility laid down for the posts applied for. c) The prescribed essential criteria is minimum and mere possession of the same does not entitle candidates to be called for interview /Test . The Competent Authority reserves the right to shortlist candidates on the basis of higher qualifications/year s of experience in the subject , by holding screening test or any other criteria deemed proper . d) Applications duly completed and forwarded by Competent authority of present employer, if applicable , should reach the institute by last date i. e 45 days from the date of publication of Advertisement in Employment News . Applications received after the closing date will not be considered. T he Institute shall not be responsible for any postal delay / lapse on the part of courier agency or any other reasons whatsoever. The decision of the Director, North Eastern Institute of Ayurveda & Homoeopathy will be final in this regard. e) The date for determining the upper age limit, qualification and/or experience will be the closing date prescribed for receipt of applications . f) Number of Vacancies may increase or decrease by the time of screening/interview by the order of the Competent Authority. No separate notice will be issued in this regard . g) In case of Posts specified as to be filled up by “ Deputation failing which by Direct Recruitment/ Contract ”, the Institute will first call candidates eligible for Deputation. In case no suitable candidates are selected, the institute will consider candidates for Direct Recruitment or Contract as provided in column No.06. h) Shortlisted candidates after due scrutiny will be called for test/interview. The interview/call letter shall be sent by speed/registered post. However, the Institute shall not be responsible for any postal delay or lapse, whatsoever. Candidates are directed to write their address, email and Mobile Number correctly. No correspondence whatsoever will be entertained from candidates regarding postal delay, conduct and result of interview and reasons for not being called for interview. i) Applicants will be fully responsible for the accuracy of the information they furnish. Any information furnished by the candidates, if found false at any stage will result in his/her dis qualification and/or dismissal /removal from the service at any stage. j) While forwarding the application the sponsoring authority/ present employers shall ensure that the particulars of the candidate are verified and that he/she fulfill s the eligibility conditions . Employer should render a certificate that the officer is free/clear from vigilance angle and no disciplinary proceeding(s) is/are pending or contemplated against the applicant. k) Copy of complete ACR dossier/APARs of last five years of the applicant (for deputation posts) must be enclosed with the application duly attested by the officer not below the rank of Under Secretary or equivalent. l) The candidate serving in Govt./Autonomous/Statutory bodies should apply through proper channel and their duly forwarded application should reach the office of Director, North Eastern Institute of Ayurveda & Homoeopathy on or before the closing date. The candidates may submit advance copy of t heir applications to the Institute in anticipation of the clearance of the department so that they are considered. However, their application duly forwarded should follow. Such cases should submit original ‘NO OBJECTION’ certificate of latest date from t heir employer at the time of interview. m) Candidate applying for more than one post must send separate application for each post along with application fee , if applicable . n ) Institute reserves the right to make any amendment to or cancellation of this advertisement wholly or partially without assigning any reason thereof. o) The appointment to the said post will be subject to production of physical and medical fitness certificate issued by a Competent Medical Authority . p) The candidate shall have to appear for interview, if called for, at his/her own cost. However traveling expenses will be reimbursed to candidates belonging to SC / ST/ PH as per Central Government rules on production of valid traveling tickets. q) The terms & conditions for appointment will be as per Recruitment Rules of North Eastern Institute of Ayurveda & Homoeopathy , Shillong. r) Any corrigendum/ order regarding this advertisement will be issued and placed on the website ( www.neiah.nic.in ) only. Candidates are advised to remain in touch with the website for this purpose. No separate corrigendum etc. will be published in Newspaper. s) Canvassing in any form may lead to disqualification of the applicant for appointment to the post. 4. Application Fee: A fee of the amount menti oned as under should be remitted by the candidates belonging to General and OBC category to the institute in the form of Demand Draft or Postal Order issued in favor of Director, North Eastern Institute of Ayurveda & Homoeopathy payable at Shillong . ST, SC and Physically Handicapped candidates are exempted from paying this fee. Applicants for Deputation also need not pay this fee. 5 . Age Relaxation : Upper age limit is Relaxable in respect of candidates belonging to SC/ST/OBC, serving Central /State Govt. / Autonomous organization employees holding analogous post/working in related field and other categories of candidates in accordance with orders issued by the Central Government from time to time. 6 . How To Apply: Application form (Prescribed format) can be download ed from the website www.neiah.nic.in . Applications in prescribed format completed in all respect s enclosing self - attested copies of all certificates, mark sheets, testimonials in support of age, educational qualifications, experience, C aste /Community/Persons with disabilities (PWD) issued by Competent authority of Central/State Govt. along with non - refundable application fee as applicable should reach the institute before the closing date on the below given address . The envelope containing application form should be superscribed "APPLICATION FOR THE POST OF________________ Sl No.___________ " and sent by registered/Speed - Post. 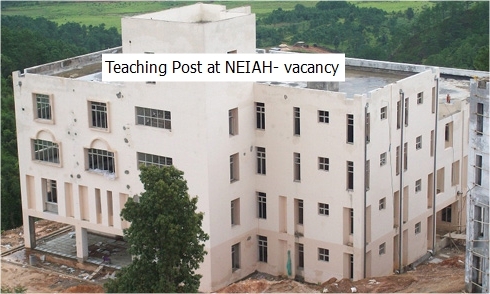 "The Director, North Eastern Institute of Ayurveda & Homoeopathy (NEIAH), OPD CITY CENTRE COMPLEX OF MEGHALAYA STATE HOUSING FINANCING COOPERATIVE SOCIETY LTD. NONGRIM HILLS, SHILLONG, MEGHALAYA – 793003 .